There's a fascinating dichotomy when it comes to charging the iPhone X. On one hand, it supports fast charging via USB-C Power Delivery (or USB-C PD), which considerably speeds up charging times compared to Apple's default 5W adapter; on the other, the iPhone X embodies a vision of leaving cables behind thanks to the adoption of wireless charging through the Qi standard. The two aren't mutually exclusive; rather, they show how charging an iPhone is becoming a less restrictive task that can fit in multiple scenarios on a typical day. While I was working on this story, I was able to test a variety of options for fast and wireless charging, and I was equally impressed with both for different reasons. I've put together detailed charts to show the differences between standard charging, USB-C PD, and wireless charging, but before I get into it, there are a few points I want to highlight. I lauded support for fast charging when it was first added to the 12.9-inch iPad Pro; the iPhone X further confirms my belief that, ideally, Apple should include the 29W USB-C charger with every iPhone and iPad in the near future. Apple may be thinking that only a minority of iPhone users would "need" fast charging, and that there's money to be made by upselling faster charging for those who want it with a standalone adapter. By the same argument though, we didn't "need" a Retina display with the iPhone 4, we didn't need wide color support with last year's iPhone 7, and we didn't need ProMotion with this year's iPads. Beyond industrial design and the software experience, iOS devices are characterized by the delight brought by new technologies we didn't think we needed. Fast charging is one of them. A technology that, in the same amount of time, doubles the charge received by an iPhone is objectively superior, better for the customer, and nicer to have – especially for people who are buying a high-end iPhone X and expect the best and nicest Apple product experience. The decision to include a 5W charger with the iPhone X is user-hostile and cheap, just like 16 GB of base storage was in the past. The 29W fast-charging adapter should become the new default for the iPad Pro and iPhone X; at the very least, the iPhone X should include a 12W USB power adapter in the box. But back to my tests. Over the past month, I bought all of Apple's USB-C adapters – 29W, 61W (included with the 13-inch MacBook Pro), and 87W (included with the 15-inch MacBook Pro). I also tested Belkin's latest USB-C car charger and Mophie's USB-C battery pack, both available from the Apple online store. Because all of these adapters adopt the Power Delivery spec, results are consistent across the board. In terms of power adapters, unless you already own the 61W and 87W bricks, you won't need them to fast-charge your iPhone X; the smaller and cheaper 29W one performs just as well. I was positively impressed by the build quality of Mophie's powerstation USB-C XXL. It's covered by a smooth, fabric-like texture that doesn't make it nearly as intimidating as any large Anker battery pack. Speaking of Anker: I own a 26800 PowerCore+ with USB-C PD, and have used it for months to recharge my iPad Pro and Nintendo Switch on the go. However, its USB-C connector now frequently disconnects from Apple's USB-C-to-Lightning cables and stops charging my iPhone and iPad. I'm not sure if this issue is my fault, or if I got a flaky unit that stopped working after a few months, but I haven't been able to test the PowerCore+ for USB-C fast charging. Conversely, if you would like to have fast charging while driving, I can't recommend Belkin's latest adapter enough. At $30, it doesn't come cheap, but it's well worth the investment if you commute a lot or use navigation apps intensively. Here's what you need to know about fast-charging an iPhone X: it only takes 60 minutes to reach 80% – the threshold after which, in theory, the iPhone's lithium-ion battery switches to slower trickle charging. In just an hour, fast charging gives your iPhone X 80% of battery life; the default 5W charger barely reaches 40% in the same amount of time. These numbers are consistent with all the USB-C PD hardware I tested. Ironically, when I was running multiple tests every day, my main problem became needing to deplete the iPhone X's battery over and over again until I reached 1%. I set brightness to the maximum level, played loud music through the speakers, ran benchmarks in Safari and games like The Witness and Pokémon GO. I always struggled to drain the iPhone X's battery in less than 90 minutes – a remarkable outcome for an unrealistic test aimed at drawing as much power as possible. I filled my kitchen with stuff using a calculator in AR mode so the iPhone's battery would drain faster. Yes, this sentence is absurd. Now that I'm back to a normal iPhone charging routine, the iPhone X's battery lasts indeed longer than the 7 Plus' on an average day. I wake up between 9:30 and 10 AM, and the 7 Plus used to show me the "20% of battery left" dialog around 10 PM; the iPhone X tends to bring up the same message around 11 PM. Thanks to fast charging, if I want to keep watching YouTube or play a game until later in the night, I only have to keep it plugged in for 30 minutes to be well over 50% again. As for wireless charging: I wasn't expecting to like it as much as I am. Yes, it's probably not accurate to call it "wireless" when there's still a wire running into the charging pad to provide power, but it's close enough and, as with many aspects of the iPhone X, it's just nice to use. Typical setup on my nightstand. I've always despised clutter, particularly cables and adapters getting in the way when I'm working or need to pick something up from my nightstand. It may sound strange, but the sight of a computer connected to a hub with a dozen cables going into it irritates me to a degree I find hard to explain. I want to avoid wires as much as possible. This is one of the reasons I like working on the iPad so much: I unplug it from the charger in the morning, place it on my desk, and all I see is the iPad, my keyboard, and the iPhone next to it. This is also why I love the portability of the Nintendo Switch, my AirPods, and Bluetooth headphones: there are never cables around me. To enable wireless charging, Apple had to switch the iPhone's enclosure from aluminum to glass. And while the company says that the iPhone X features "the most durable glass ever in a smartphone", the reality is that glass has a high chance of shattering if dropped. Unfortunately, because of how the iPhone X is built, a damaged back means a full unit replacement, not a repair. I know from experience. Two weeks after I got the iPhone X, one of my dogs bumped into my nightstand in the morning; the iPhone X was not inside a case, and it was not connected to a Lightning cable, or placed on the charging stand. As a result, it just slid across the nightstand, fell onto our hardwood floor, and its glass back shattered. Thankfully, I had purchased AppleCare+ for the iPhone X, so Apple gave me a new one as soon as I went to the Genius Bar, which cost €99 (instead of €599 without AppleCare). I learned my lesson: Apple may think it's the most durable glass they ever made, but there's no tricking physics when glass meets the floor. I'm keeping my iPhone X in a black Apple silicone case now. I liked the better grip of glass in the hand compared to the slippery aluminum of the iPhone 6-7 line, and putting a case on the iPhone X diminishes its beautiful edge-to-edge design, but I don't want to end up with another shattered iPhone anytime soon. Wireless charging works fine with the Apple case, which doesn't conflict with the Home indicator gestures either. The iPhone X's current implementation of Qi wireless charging isn't fast13, but it's elegant, convenient, and feels like the future. If I'm cooking and want to top-up my iPhone's battery a little bit, I can just place it on a pad in the kitchen. I don't need to worry about my dogs yanking a Lightning cable attached to my iPhone on a nightstand; before I go to sleep, I place the iPhone X on Samsung's Qi charging stand, and I'm done. The stand even props up the iPhone at a 50-degree angle, so I can tap on the screen in the morning to check the time. And, unlike a dock, I don't have to precisely match the Lightning connector with the port on my iPhone – I can simply put the iPhone on top of the stand without paying much attention to the process. My favorite Qi device I've tested so far, though, isn't a charging pad or stand – it's Mophie's charge force powerstation, a portable Qi battery. I discovered the existence of this product a couple of weeks ago, and it's quickly become a fixture of my working setup as it fulfills the dream of true wireless charging with no cables involved. 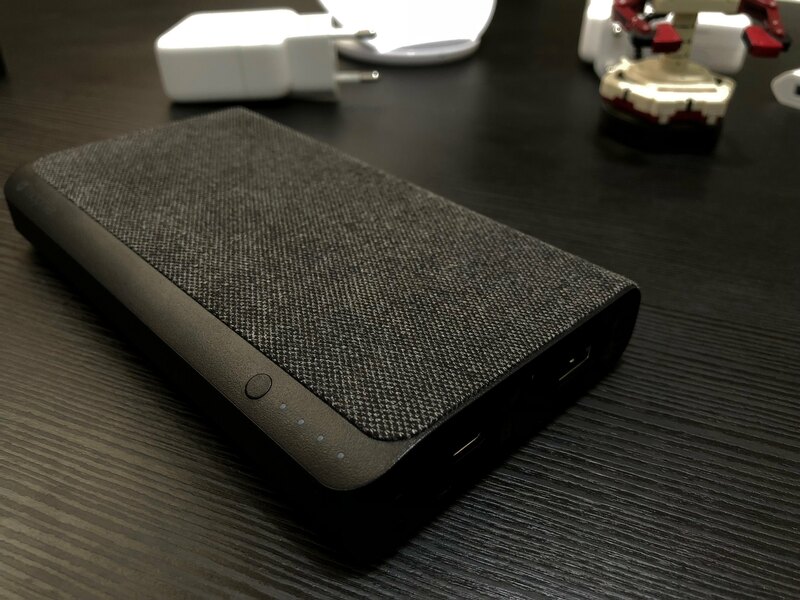 The charge force powerstation is a standard battery pack with two USB-A ports, but the top doubles as a Qi surface for compatible smartphones, including the iPhone X. 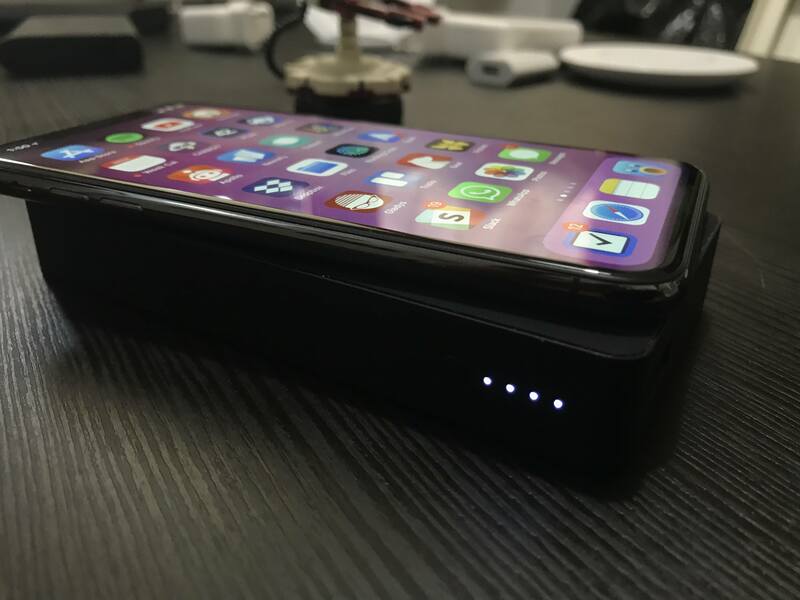 Now, whenever I'm working, I can put the iPhone X on top of the battery (which is just as small as the iPhone itself) and let it charge, slowly. When I need my iPhone to check something, I pick it up, use it for a couple of minutes, then place it down on the battery again, where it continues to charge. There are no cables strewn all over my desk and, unlike a traditional dock, I'm not forced to keep it in one location; I can carry the battery with me around the house and have my iPhone always at 100% when it's time to leave. I'm surprised I haven't seen more mentions of Mophie's Qi battery. 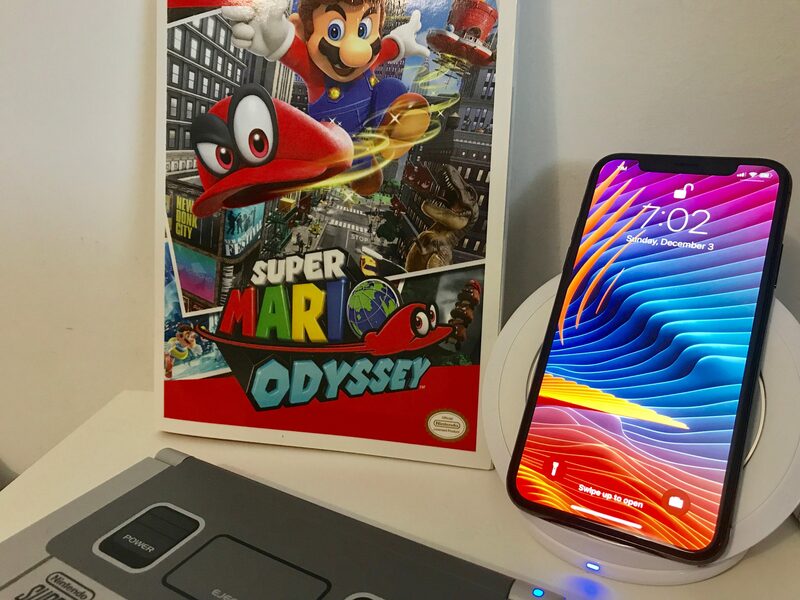 To me, it represents the essence of wireless charging: it's not a replacement for standard or fast charging – it brings a series of small conveniences that remove the friction of cables, the clutter of wired chargers, and the stress of having an iPhone's battery run low during the day. It's tough to compare fast charging via USB-C Power Delivery and wireless charging based on Qi: one is meant to fill your devices' batteries as quickly as possible, but requires a cable; the other is more convenient, but much slower, often requiring more than twice the time of fast charging. 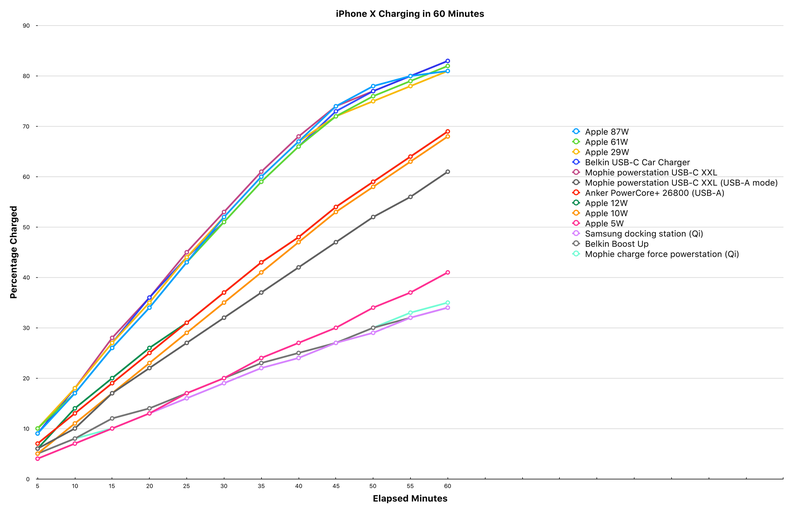 In terms of performance alone, any chart is going to be skewed in favor of USB-C PD and fast charging. Still, I wanted to run my own tests to answer a simple question: if I only have an hour of free time, how do all the compatible iPhone X chargers I have compare to each other? The 60-minute charging test, in addition to being a relatable situation that often occurs in everyday life, happens to avoid the inconsistencies caused by slower trickle charging, which Apple adopts for all of their batteries. Here's what I settled on: I drained the iPhone to 1%, then left it charging in Airplane mode, with the screen off, and measured its battery percentage every 5 minutes over the course of an hour (12 times). As I detailed in Issue 105 of MacStories Weekly, I used a workflow on my iPad Pro to help me with the reporting process. Of course, it's impossible to test every single iPhone-compatible charger. 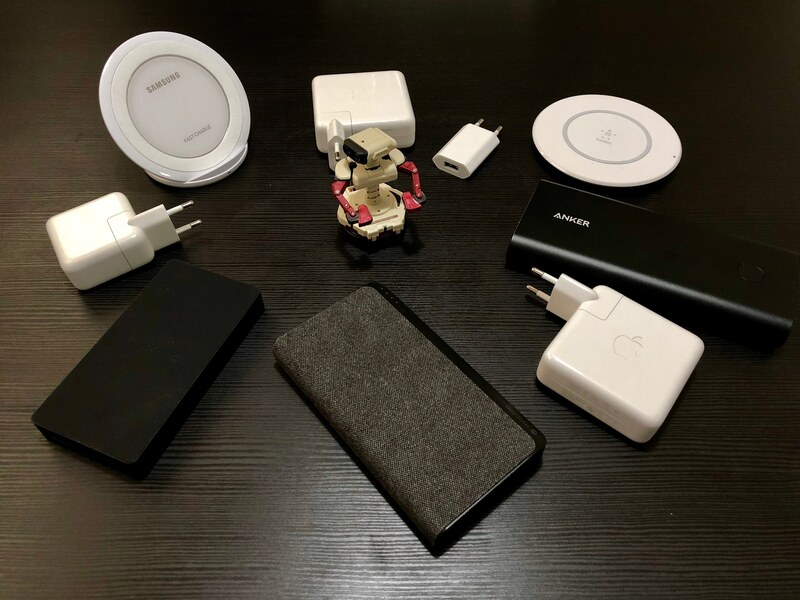 Still, I tried to assemble a good mix of different options – wireless chargers, Apple's official chargers, battery packs, and USB-C PD chargers. Chargers are grouped by category: Qi, USB-A, and USB-C. There are a few conclusions to be drawn from these tests. First and most notably, the difference in performance between the default 5W charger and any USB-C PD accessory is massive; in the same 1-hour window, the 5W charger barely gets the iPhone X at 40%, while fast charging puts it over 80%. In my experience, the 5W brick charges an iPhone X by 3-4% every 5 minutes; fast charging averages 8-9% before it slows down. At thirty minutes, fast charging is already above 50%, while the iPhone's default 5W charger may have not even reached the 20% necessary to dismiss the low power alert. For such a premium device, the 5W charger is a cheap disgrace. As expected, the numbers from Qi chargers aren't great – they actually fare worse than Apple's 5W brick. iOS 11.2 has enabled faster wireless charging at 7.5W for compatible devices – still far from the Qi spec's supported 15W, but better than the initial 5W limit on iOS 11.1 nonetheless. Of all the Qi chargers mentioned in this story, only Belkin's Boost Up mat officially supports 7.5W charging on iOS 11.2; even at the faster charging rate though, it's not as fast as Apple's stock USB charger, and minor performance gains over 5W wireless charging can only be seen after an hour. For now, it is abundantly clear that you should only buy a wireless charger for the convenience and the freedom of it; hopefully, once wireless charging has been tested at scale on millions of iPhone 8 and X units, Apple will add support for the superior Qi 1.2 spec. Once that happens, wireless charging might become both convenient and powerful enough to compete with USB-C fast charging. Speaking of which: you may have noticed that the numbers reported by the USB-C PD devices I tested are noticeably consistent in the chart – most of the lines overlap with each other and are difficult to identify. This is due to the strict requirements of the USB-C PD spec, which, thankfully, Apple, Mophie, and Belkin all follow. What's also apparent – although I haven't been able to clarify this through official Apple documentation – is that fast charging slows down after the battery hits 70% (instead of Apple's claimed 80%), jumping from 8-9% of charge every 5 minutes to 3-4%. I assume that the iPhone X, because of its dual-battery configuration, has introduced changes to the threshold for trickle charging. I’d be interested to hear more from Apple on this. Unless you truly care about reaching a full battery in the shortest amount of time possible, Apple's 12W adapter is the best deal for most iPhone X owners who want something better than the 5W charger in the box without spending $50. But then again, USB-C adapters have the added convenience of supporting high-wattage charging for multiple devices: an Apple 61W brick, for instance, will charge your iPhone X, Nintendo Switch, or 13-inch MacBook Pro, negotiating the optimal fast/normal charging rate for each thanks to Power Delivery. For now, fast charging remains more impressive on the largest iPad Pro than on the iPhone X, but the increased versatility of USB-C is an aspect I'm starting to value more as several of my most important devices support the standard. I'm convinced that Apple's end goal with the iPhone and its wearable accessories is a future without wires or concerns about battery life: after using your iPhone, AirPods, and Apple Watch normally throughout the day, you'll just place them on an AirPower mat and forget about cables, adapters, and battery packs. After testing third-party wireless chargers and witnessing the impressive battery life of the iPhone X on an average day, I'm excited about the prospect of a single AirPower mat to rule them all. However, AirPower isn't here yet and, realistically, it'll take a few iterations to achieve the dream of every device fully charged in under an hour. Until we get there, Apple has opted for flexibility – giving users multiple options to charge their iPhones with varying degrees of efficiency, convenience, and price. I would have liked Apple to include a better charger with the iPhone X, but, on the other hand, I'm happy the iPhone X is ushering in a new era of USB-C PD, wireless charging, and longer battery life.